CAMP RUPERTO KANGLEON, PALO, Leyte- The embattled police provincial director for Samar, Senior Superintendent Nicholas Torre III, said that he is willing to reach out to his perceived adversaries in the province. He, however, was quick to say that his adversaries should not take his actions personally as he maintained that these were just part of his duty as a police officer. Torre became the first ever police official of the region to be declared as persona non grata after the city council of Calbayog City passed a resolution of such effect on May 21 citing his alleged failure to solve killing incidents in the city and some towns of the province. 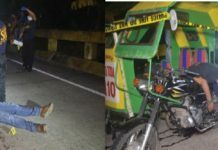 This allegation was denied by Torre saying that most of the killing incidents cited occurred when he was not yet the provincial director of Samar. “Of course (I’m willing to reach out to them). I don’t see any problem of it. I did not start the problem. If we have some differences of opinions, so be it,” he said Monday (June 4). “I’m not mad (with them). It’s just part of my job and spices of my being a police officer,” Torre added. He also said that despite of the persona non grata resolution, he still visits Calbayog to meet his men there. Torre also said that he is proud of the police force of Calbayog, calling them ‘professionals’ and ‘shield’ them from getting involved in partisan politics. 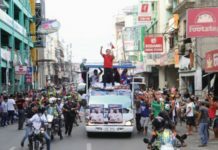 He also dismissed the claim that he played favorite among officials in Samar saying that as a provincial director, he deals most of the time with Governor Sharee Ann Tan, who chair the Regional Peace and Order Council. “I am a provincial director and we work closely with the governor and other government officials,” Torre said. The incumbent mayor of Calbayog City, Reynaldo Aquino, is a known political enemy of Gov. Tan whose sister Angel, ran against him during the 2016 elections. Asked if his confident that he could retain his post with a new regional director, Torre said that he will leave it up to their new leader, Chief Supt. Mariel Magaway, to decide. “That’s remain to be seen. It depends to our new regional director. It depends on his appreciation, on my performance. I always respect the decision of the higher-ups,” Torre said. But if he will be relief from his post, Torre said that he will accept it. “That’s ok. Why, is my name engrave forever as a provincial director?” Torre said. Torre has the backing of several town mayors of the province, to include Catbalogan City Mayor Stephany Uy-Tan, and Gov. Tan.